As mentioned in an earlier section, Springfield Park often held wrestling bouts in front of large crowds well into the 1930’s and during an unscheduled visit to the Museum of Wigan Life, I happened across an exhibition of local sport which contained the photo of Rose and Daley (right) before a bout at “Poolstock dog track” and something rang a bell. A few years ago the Wigan Evening Post ran a series of photographs in their nostalgia section which I recognised as Springfield Park and after a few phone calls I managed to find out that local photographer Frank Orrell had offered them to the paper. Frank very kindly copied the photographs onto a CD, brought them round to my house and explained he had managed to rescue about 50 other glass plate images from a skip when Lancashire Publications were moving to Preston. One of these photographs featured the same two wrestlers and the rather imposing referee, Abber Waggs. After some more digging around, I found the following article from the Lancashire Evening Post of 13 February 1951, which relates directly to the MoWL photograph. The bout took place on 5 July 1919. 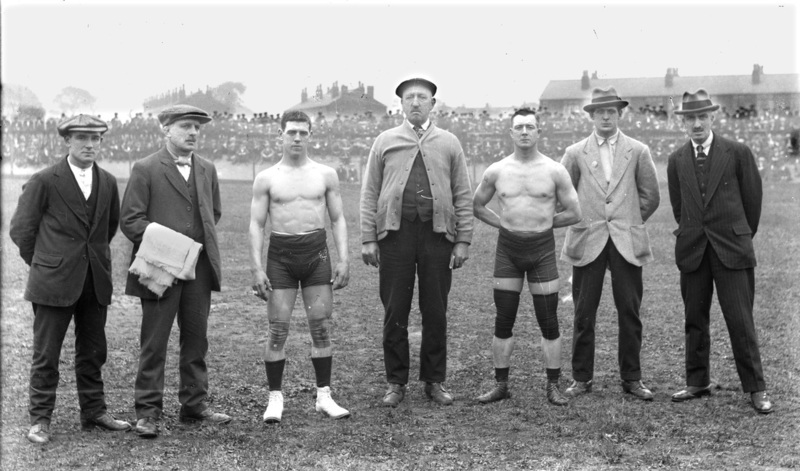 The farewell appearance of that grand old Wigan wrestler and all-round athlere, Tom Rose illustrates this, the first of a pictorial series on the wrestlers who made Wigan the home of the sport. Rose, who was lightweight champion of the world, and won a Lonsdale Belt at the Alhambra Tournament in London, is shaking hands with Joe Daley 10st. 6lb. champion of England, from, Standish Lower Ground before their challenge match at Springfield Park. Watched by 5,000 spectators they wrestled in the middle of the pitch under catch-as-catch-can rules, and there was no supporting programme. But in those days, 5,000 Wiganers would pay just to see two top-notchers, and a lot of money used to change hands. The referee is an old-time personality, Abber Waggs. Rose, who was defeated by Daley, was then in the twilight of his career. The pair were matched again, but the arrangements were cancelled, and Daley went on a U.S. tour about 1921. He married and settled down in America, where he died just before the last war [WW-II]. Rose now lives in Blackpool, and although born at Bottling Wood, spent much of his time in Bolton. He covered the 100-yards in 10 1/2secs., won the Talbot Bowling Handicap, had a perfect physique, toured the music halls before the 1914-18 War, and lost only about six matches in the whole of his career. A fine boxer, he regularly went 15 rounds with good-class opponents at Manchester's Free Trade Hall. He was an exceptionally clever wrestler. He began work as a collier, as did Daley, who also defeated all the best men in Britain, including Billy Moores and Walter Mooney. The houses behind Daley are Newman Avenue, the spectators are sat on the cycle track and the pitch was in bad condition back then. This would have been about the time that Wigan United started playing at Springfield Park. On Saturday upwards of 6,000 people assembled at the Springfield Park, Wigan to witness the meeting of Joe Daley, of Standish, and Tom Rose, Bolton, who had signed articles to wrestle the best of three falls, with a 1 ½ hours time limit, for £50 aside and the welter-weight championship of Great Britain at 7sc. 8lb. ringside. Rose, who is 34 years of age, up to the outbreak of the war was the champion at this weight, since when the event, in common with other championships, has been in abeyance. Rose has done some wrestling whilst in the army, but nothing that suggested first- class opposition. Daley, who follows the occupation of a collier, and is 26 years of age, was a wrestler of much promise prior to the war, and has since done practically everything asked of him in matches from 6sc. 18lbs. upwards. By many he was regarded as equal to the pre-war standard, though it was not until his recent and decisive victory over Miles Sweeney that he was generally accepted as dangerous opposition for Rose. After the victory over Sweeney at 7sc. 4lb., and despite the fact that Daley could even make a slightly lower weight than 7-4, Daley rapidly grew in favour in the suggested match with Tom Rose, who had announced his intention of following up his profession where he left it off on joining the colours. Straightaway Rose made two matches, one with Jack Carroll, who was allowed to come in 7-12 to Rose’s 7-10, and the other with Daley at the welter-weight limit. Rose’s victory over Carroll suggested some retention of his old form and added interest to last Saturday’s meeting. During the week the match was the chief topic in wrestling circles, and before the pair took the ring a pile of money changed hands, and wagers of £150 to £100, £50 to £30 (three times), £90 to £60, £60 to £40, and £16 to £10 were recorded. Rose was trained by Jimmy Taylor at Bradshaw, whilst Jack Hodson, of Wigan, was responsible for Daley’s preparation. Both looked fit as they mounted the scales. Rose weighed in to the weight of a sixpenny piece, whilst Daley was 2lb inside. Jack Smith, of Greenheys, had control of the match, but owing to his late arrival, his deputy Ab’o’th’ Wags officiated as referee, and the men were given the word to start at 4.55. Excitement ran high when the pair came to grips, and they were not long at the head before Daley got behind, though he had hardly registered the position before Rose broke clear. In the headwork that followed, Daley was very strong which Rose showed tacit admission of by his willingness for free and open wrestling. Taking the initiative at the lead, Daley was responsible for another rally, but Rose picked up a leg on the breakaway, climbed on top and applied the “scissors,” but Daley waited underneath long enough to “hump” Rose over the top, and, coming from underneath seized a foot and got behind, when an application of a three-quarter found rose something to do before he cleared. After some further work at the head, the pair again mixed merrily in an exchange of legs and here it was seen that whilst Rose was perhaps the cleverer, the power of the youngster, who never refused any kind of work that was going, began to assert itself. After another lightening exchange of back positions, Daley from behind again gave Rose some trouble by his powerful application of the three-quarter. Rose failing in his attempts to counter the move to advantage. At another attempt later the resistance of the champion was obviously weaker, and at the next application Rose was turned over on his back, Daley securing the first fall in 24 ½ minutes. Though clearly weakened by his efforts in the first bout, Rose went well to his work for the second fall, and his wrestling was good, but his snap and finish were not there as was instanced when he caught Daley with a neat cross-buttock, bringing him nicely to the floor; but he failed to get across his man to finish him. The youth came out nicely with a good show of power, and weakened Rose in the subsequent headwork. The wrestling was good, and pretty much a repetition of the first fall. In the final rally Rose nicely went for a leg, but although Daley lost the first half of the trick, he stood up for a mix up, and as Rose was reaching for a far leg, Daley changed his objective and “plucked” Rose strongly to the floor, his further fight to the back position not being a very difficult one. Before he had actually settled behind Daley applied the three-quarters, and Rose was promptly turned over and downed for the second fall in 16min. 10 sec., Daley thereby winning the match. The stakes were paid over immediately after the bout.